Today I have a cute giveaway for you from Paper Love Stationary. 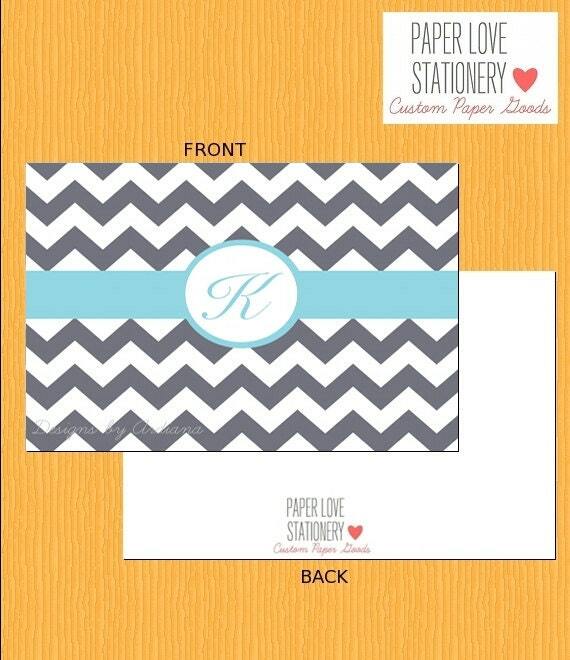 A beautiful set of chevron monogramed note cards that you will be able to customize (colour and monogram). Visit Paper Love Stationary and tell me what your favourite item in the shop is! I will announce the winner on September 20th. Good luck! PS. The winner of the giveaway from Beauty and the Feast is...Valerie! Congratulations! The little owl notecards are too sweet! My favorite are the Keep Calm and Carry Yarn Note Cards! I love cute stationery - I write so many pen pal letters that it's always handy to have some more cards. I love the bicycle one or the one with the three little owls on it. I love the Chevron Invitations! I hope I can enter even tho im from Denmark?! I live the bicycle notecards, they are so cute.. so are the chevron initials ones, I love anything personalized! It's hard to pick, but I have a thing for umbrellas right now, so I'm going to say the umbrella note cards, although I really love the ombre chevrons! I really love the ombre chevron thank you cards! The chevron heart thank you cards are so cute! I am a knitter so I love the Keep Calm and Carry Yarn card. The bicycle note cards are too cute! I love the little owl notecards - anything with owls is adorable! I have to say, I think these are positivley adorable! The mustache for the groom & the lips for the bride is so cute! I especially love the color scheme, something about it reminds me of an old timey ice cream shoppe. Totally want to use these someday! my favorite in the shop are the ombre chevron thank you cards. I love the "hello" note cards with the bike. Adorable. The Little Owl Note Cards are adorable!! I do love owls but the bicycle note cards are my favorite. It's a toss up between the bicycle and umbrella note cards. They're both too cute. oooo i like the Floral Note Cards + the Bicycle Note Cards. Too Cute! I love the chevron thankyou cards in the shop. What a sweet giveaway. I love all the cards, but am quite partial to the ombre chevron and striped thank you cards! oooooh I really love the umbrella bridal shower invites. i like the Floral Note Cards the best! ooh, the bicycle note cards are great! loveeeeee the chevron note cards! Ooh so many pretty note cards! I love the chevron invitations. My favourite item is the ombre chevron cards. I'm already married, but I really like the Modern Couples Shower Invitation and Vintage Inspired Bridal Shower Invitations. Ooh! It's a tie between the poppy fields thank yous and every day's a tea party note cards. So cute! You can find me at missionamanda at gmail dot com. Cute! I love the keep calm and carry yarn cards, of course! I love the little owl cards!! The Umbrella Note Cards are simple but so cute! The floral notecards are very cute! Oh my goodness! Their notecards are SO cute. I love the ones with owls on them. It's tough to choose between the bicycle and the umbrella, but I think the shiny red balloon does it for me! So definitely the bicycle note cards for me. I've been searching everywhere for the perfect invitations for my sister's bridal shower and I have now found them! I love those vintage invitations! They're perfect! I love the chevrons, but the little owl note cards are super cute too! I love the owl cards! Such cute stationary! Every Day's A Tea Party Note Cards is my favourite design! So cute! The lineart on the poppy fields thank you card is just stunning. I really like the chevron banner heart thank you notes....the owl note cards are pretty darn cute too! I love the "Everyday's A Tea Party" note cards. so cute. I'm slightly obsessed with the Chevron Engagement Party Invite... the one with the yellow, pink, and grey... IN LOVE!!! I love the Chevron Banner Heart Thank You cards! So simple and sweet! I love the umbrella note cards! I live in Seattle and fall is coming up so the umbrella is so fitting. I love the ombre chevron thank you cards!